The Marine Corps was created in April 1949 in Jinhae, South Gyeongsang Province, to meet the need for troops specializing in amphibious landing operations. Under the leadership of Lieut. Col. Shin Hyeon-jun, the country’s first marine group consisting of 380 troops, all of whom were transferred from the Navy, toiled to lay the foundation to establish a strong amphibious landing force. 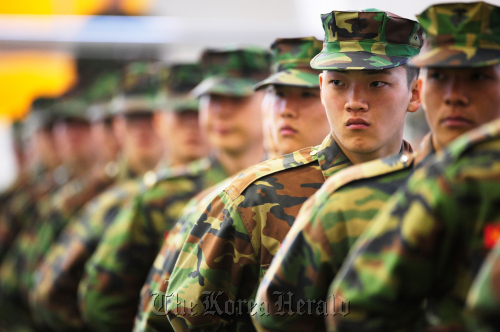 What began as a small military unit has now grown into the 27,000-strong armed service with its bases on the five border islands in the West Sea and in Pohang, North Gyeongsang Province, and other locations. Before the outbreak of the 1950-53 Korean War, the marine forces engaged in a variety of operations to ensure public security, enlighten local residents and mop up communist guerillas in Jinju, South Gyeongsang Province, and on Jeju Island. After the fratricidal war broke out on June 25, 1950, the marines put themselves at the vanguard of the efforts to protect the country against the North Korean invasion. The marine troops clinched victories in a series of battles including those in Jindong-ri of Masan, and Tongyeong, both in South Gyeongsang Province. The victories earned the Marine Corps the popular nickname of “ghost-catching” marines. One of the most famous marine operations was the Incheon landing that helped change the course of the three-year war. The historic operation, which was led by Gen. Douglas MacArthur, then commander of the U.S.-led U.N. forces, began on Sept. 15, 1950 and successfully cut off supplies and communications for North Korean troops. Some 75,000 troops and 261 naval vessels were deployed for the operation. Following the successful landing, the allied troops advanced to Seoul. 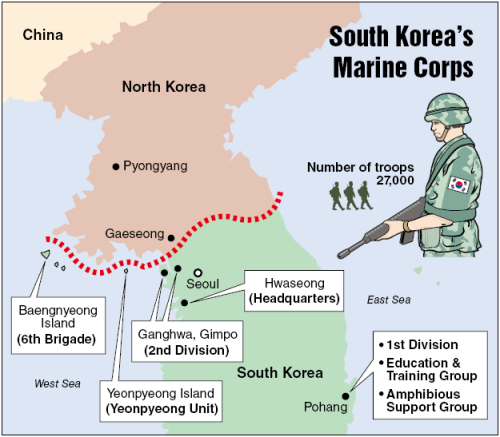 South Korean marines along with U.S. forces fought fiercely against North Korean troops for 11 days and recaptured Seoul on Sept. 28, some 90 days after the North occupied the South Korean capital. Marine troops’ operation in Tongyeong from Aug. 17 to Sept. 20 in 1950 has also been regarded as a historic marine achievement. The operation secured the western side of the Nakdong River perimeter after defeating enemy forces with fierce resistance. Another notable operation was the one aimed at safeguarding the strategically crucial frontline islands in the West and East Seas. In April and May 1951, marine troops arrived on western islands including Baengnyeong Island and conducted operations to protect the coastal lines there against North Korean infiltration. The military had since increased the number of marine troops on the islands up to a regiment level until the Armistice Agreement was signed in July 1953. The marine operations were critical in keeping the crucial northwestern islands under the control of South Korea. Some 5,200 marine troops are currently stationed on the five border islands. After the Korean War ended in a truce, the Marine Corps reorganized itself to become more sophisticated in terms of its troop management, training and overall operations. South Korean marines’ combat capabilities gained international recognition after its audacious operations during the Vietnam War in the 1960s. To protect Vietnam from the communist invasion, the Seoul government and the National Assembly endorsed the dispatch of a South Korean marine contingent there in August 1964. In September 1965, the Marine Corps created the Cheongnyong unit, which became the country’s first combat unit dispatched overseas. Arriving in Cam Ranh Bay in Vietnam in October 1965, the unit engaged in a number of battles for some six years and five months. The last batch of South Korean marines withdrew from Vietnam in February 1972. During their dispatch in Vietnam, the marine unit also carried out volunteer services for Vietnamese residents such as offering medical assistance and engaging in relief campaigns and reconstruction efforts. Despite such achievements during their wartime and peacetime operations, the Marine Corps also had its own trials and tribulations. One of them was the disbandment of the Marine Command. Ostensibly, to economically and effectively manage the military, the Marine Command was merged into the Navy in October 1973. Until the command was reestablished in November 1987, a marine department in the Navy Headquarters had led the marine troops. Currently, there are six major marine installations, excluding the Marine Headquarters in Hwaseong, Gyeonggi Province. The 1st Marine Division, located in Pohang, North Gyeongsang Province, maintains strategic marine troops. It is designed to stage amphibious landings and land-based operations under warfare situations. The Amphibious Support Group is also based in the southeastern port city. The 2nd Division located in Gimpo and Ganghwa is in charge of defending the islands near the western inter-Korean sea border, which has repeatedly been the scene of naval skirmishes between the two Koreas. The Yeonpyeong Unit and the 6th Brigade are based on the five frontline islands in the West Sea with a mission to monitor North Korean military movements and protect the islands from possible provocations. All marine troops, irrespective of their ranks, receive basic military training at the Education and Training Group in Pohang. The ETG, dubbed the “cradle of marines,” trains some 12,000 recruits per year ― who join the Marine Corps for their military duty. It was established in 1977. Although the basic training course for marine recruits is said to be the toughest in the armed services, the number of applicants has increased. Last month, the competition rate was 3.57 applicants per place, higher than the average of 2.1 to 1.